Photography as we know it has its techno-cultural origins in the first half of the 19th century, but as a natural phenomenon photography must have been known since ages. German art historian and philosopher Peter Geimer, in Bilder aus Versehen: Eine Geschichte fotografischer Erscheinungen [Images by Accident : A History of Photographic Appearances], tells of an example of a photographic image of a book page appearing on an altar cloth during a thunderstrike in 1689. And it may even be possible that prehistoric peoples already had seen photographic images appearing in their tents. What is particularly revolutionary about the “discovery” of photography as announced in 1839 was the chemical art of fixing photographic appearances on material that has been prepared with light-sensitive emulsions. Light, writes Geimer, is the premise [Fall] of photography, too much light, its accident [Unfall]. To fix a photographic image means to (attempt to) stop the natural process of its disappearance. The images of many of photography’s incunables we know of are long faded, and ironically conserved through the means of photographic reproduction. Unexpected phenomena entering photographic images do make us aware of photography’s photographicness. By reappraising the functioning of noise in photographic processes, Geimer criticises common theories about photography outlined along dualities and assuming transparency. Think of John Szarkowski’s influential metaphors of photography as window or mirror. But photography is not just an image of nature, it is itself part of nature, hence subject to material transformation and physical decline. 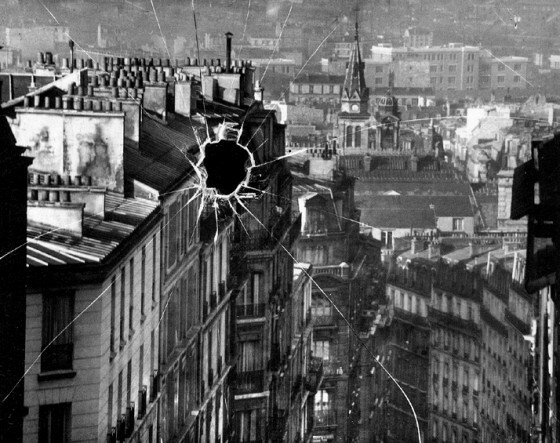 André Kertész - Broken Plate (Paris, 1929). Gelatine silver print. Photography’s unstable nature was turned into an advantage by adventurous scientists and artists in the later decades of the 19th century, as Geimer describes in two case studies. One of them about photography of effluvia emanating from human beings, as developed by Jules-Bernard Luys. 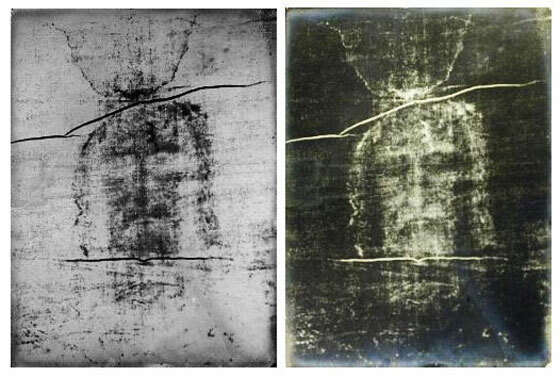 The other one about the first photographing in 1898 of the shroud of Turin, which is believed to show the real image of Christ. In the photographic negative a positive image of a body appeared. Thus the cloth was assumed to be an imprint of the real Christ. The struggle of interpretations that followed has far-reaching implications for an epistemology of photography. Following this, Geimer convincingly argues to think beyond classical dichotomies (like nature vs. culture) in theorizing about photography and to acknowledge it as a unity of seemingly conflicting characteristics. In experimental settings the unexpected (and unimaginable) has been deliberately used in bringing to light matters previously without contours. Distortions turned out not to be a negative modus of the visual, but to offer a particular potential of photography. Moreover, not only light seemed to work on photographic emulsions, but also radio waves, electricity, warmth, and X-rays; its discoveries contributing to the making visible of the invisible. This does not mean that the invisible was lying in wait latently until its visibility would be discovered, instead its visibility had to be imagined and arranged. Geimer suspends any final conclusions of his theses, but his original and fresh re-evaluation of the debates around early artistic and scientific experimental photographic practices demonstrates to us that we shall perhaps never be able to fully comprehend the inner workings of the black box, which the entire photographic process ultimately is. Neither will we be able to gain full control, not even in the digital era, over the photographic image, hence we can never be the sole “authors” of our photographs. For those still believing in Szarkowski’s mirror and window theory, they now can learn that photography once and for all will be an inextricable mingling of art and artefact, of science and art, of visibility and becoming invisible, and of seeing and believing. What we see in photographs is only partly what we get. This book review appeared in print in Camera Austria 112 (2010), pp. 85-86.